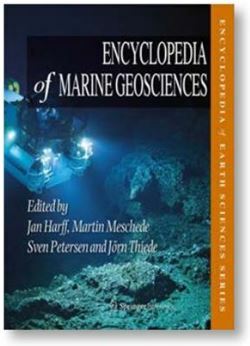 The Encyclopedia of Marine Geosciences was selected for the 2017 Mary B. Ansari Best Geoscience Research Resource Work Award of The Geoscience Information Society (GSIS). The formal award will be given at the GSA 2017 conference in October in Seattle/USA. EarthByters Dietmar Muller and Maria Seton contributed two chapters on “Paleophysiography of Ocean Basins” and “Plate Motion”. Globally growing demand of energy and mineral resources, reliable future projection of climate processes and the protection of coasts to mitigate the threats of disasters and hazards require a comprehensive understanding of the structure, ongoing processes and genesis of the marine geosphere. Beyond the “classical” research fields in marine geology in current time more general concepts have been evolved integrating marine geophysics, hydrography, marine biology, climatology and ecology. As an umbrella the term “marine geosciences” has been broadly accepted for this new complex field of research and the solutions of practical tasks in the marine realm.